To sort of celebrate my vacation -- with you guys -- I wanted to do something a little different this week...a few giveaways, with a twist. I've picked three designers that I highly respect (and whose products I own and love) and asked each of them to share what inspired them as they created their latest line. They've also each generously agreed to offer up a gift to one of you. I'm kicking things off with Annabel from Wolfum. 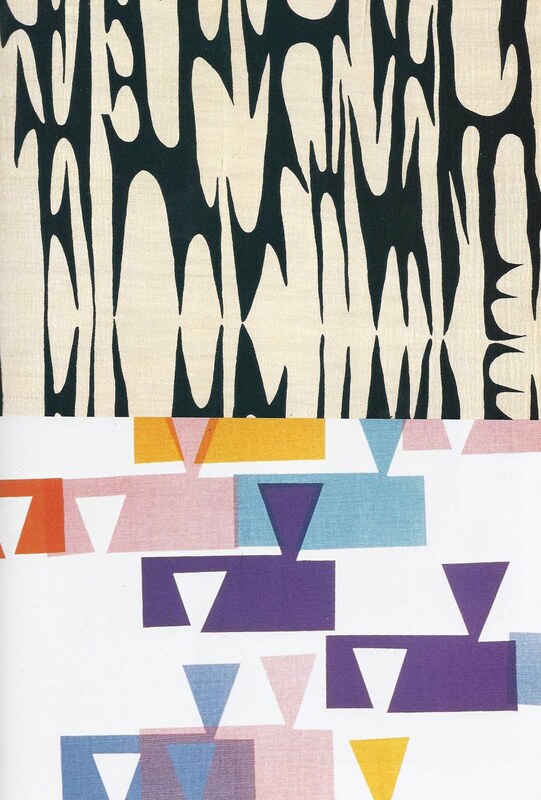 I am hugely fond of Annabel's interesting, modern, artful textiles. I bought two of her "Blue Love" pillows recently, and they are among my absolute favorite purchases. 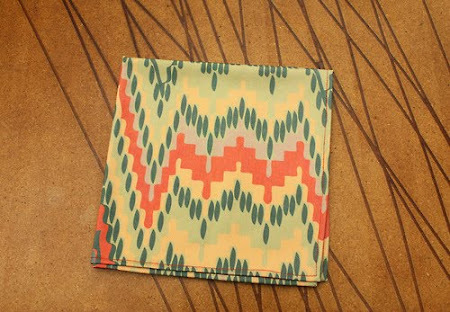 Annabel has offered up a set of her "flame stitch" cloth napkins (pictured above). Just leave a comment on this post by Sunday the 24th at midnight, and I'll announce a winner when I'm back on Monday! And without further ado, here's what's inspiring Annabel...Enjoy! 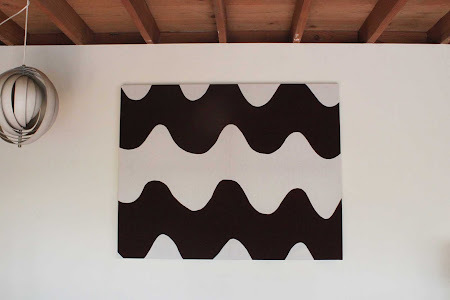 "Lokki" fabric by Maija Isola for Marimekko – I bought this fabric on eBay and then stretched it to use as wall art. 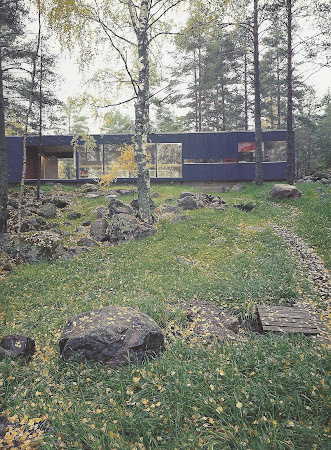 It is a perfect example of how a simple shape is made wonderful through color and proportion. Clean, organic, balanced and totally modern. I admire this recipe. 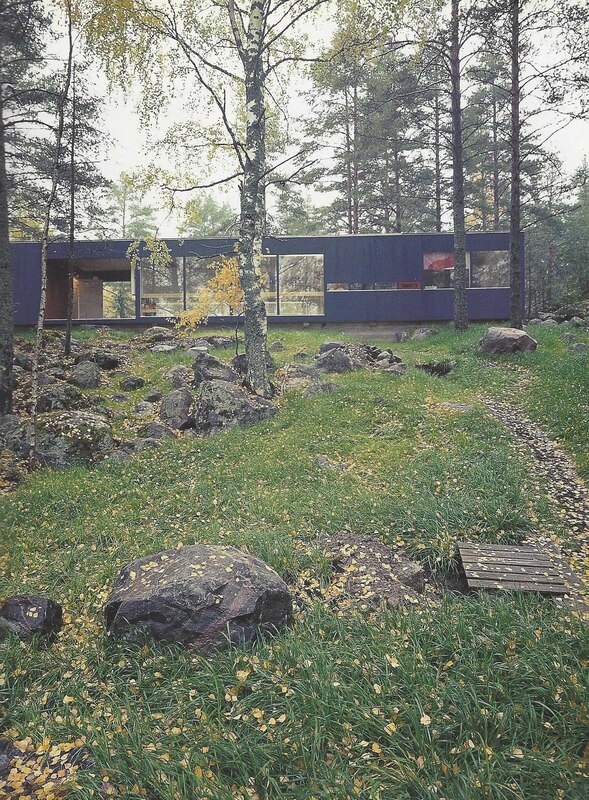 Architecture in Nature -- Whenever I’m designing, it helps to imagine the homes in which I see my product. This is my favorite home, all nestled in the woods. It is so quiet yet makes quite a statement. Family -- These are my paternal grandparents when they were first courting. He was Italian and imported textiles; she was a New York socialite. They were both very eccentric and strong willed and I love how they complimented and contradicted each other. He inspires texture and vibrancy while she evokes order and etiquette. Alexander Girard – So much to love! 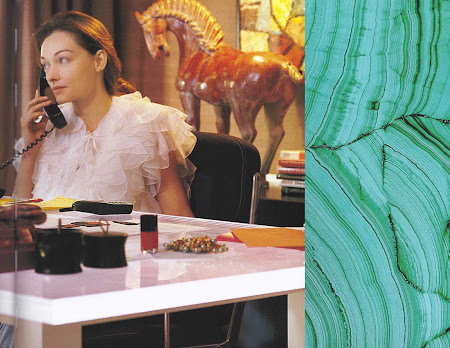 His work is prolific, his colors are surprising and his designs find that perfect balance of sophistication and quirk. The folk art elements remind me of my childhood and the use of print with product serves as the roots of Wolfum. Kelly Wearstler -- "living without color is like living without love"
I have been obsessing over all of the Wolfum products, just waiting for there to be an online store. But winning the flame stitch napkins would be even better! You had me at marimekko! Love your inspiration list. I was so taken aback the other day when you posted that gorgeous Wolfum textile--the square within a square with the orange border. I was positively stopped dead in my tracks. Honest. Well here you go again. Annabel's inspirations are hugely inspiring. Her choices are so telling of her own aesthetic. I'm simply in love with each. And may I just say, Annabel, your paternal grandparents are quite the fetching couple. 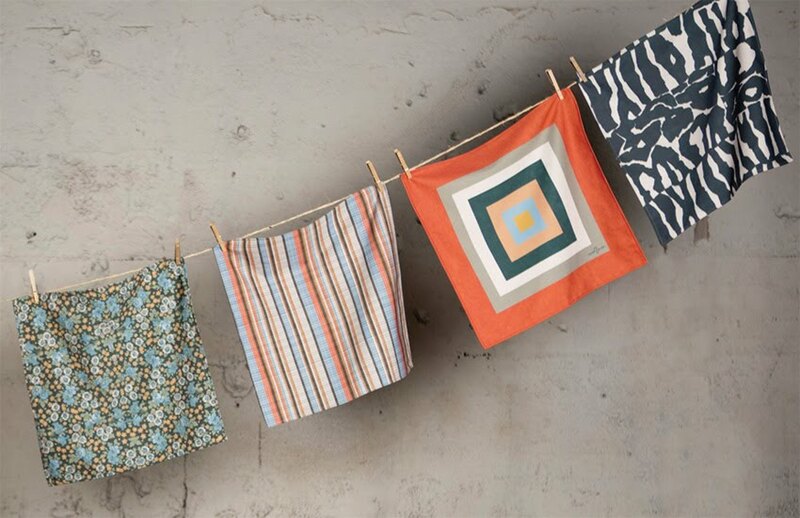 Wow, those are beautiful textiles. I might not use them as napkins - I'd cringe with spagetti or something was mashed into them! I love Wolfum! The prints are so light and refreshing! Such a great giveaway! I especially love the picture of her grandparents. So very hip in all white! Love the napkins and so inspired by architecture in nature as well. Simply lovely napkins - I <3 them! very inspiring! the napkins are gorgeous! Oh wow, we use cloth napkins all right - but we don't have any that look like those! Gorgeous! 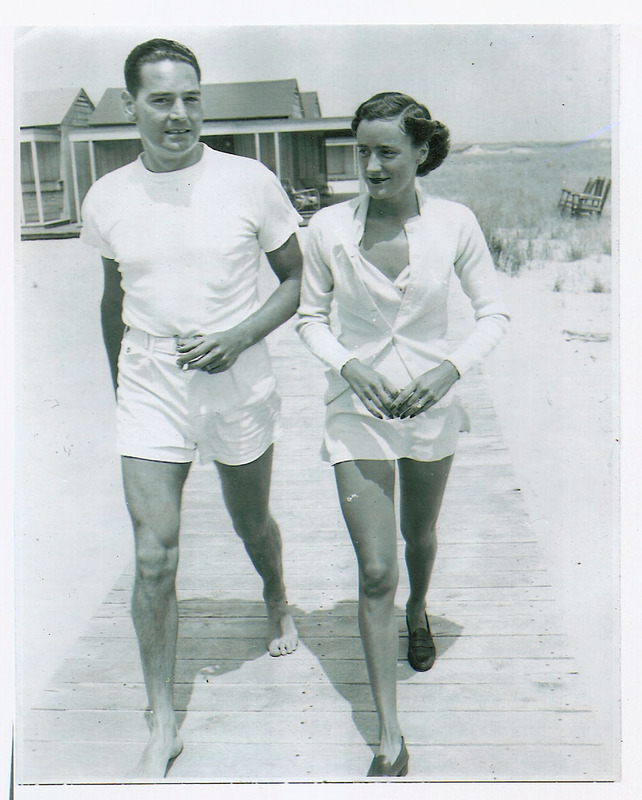 I am completely smitten with the photo of the grandparents. I just love old photos of elegant people from years gone by. What a wonderful, beautiful, ever-changing world! Love your 'guests' and the the giveaway. I love the designs and have been such a fan for sometime! Thanks for hosting! P.S. Love the image of the grandparents! Just amazing! What a great way to start the Monday morning! I've been wanting some cloth napkins, but haven't found any ones I like - these are adorable! Way better than paper towels. Oh how beautiful....they would be so perfect for our family as we're trying to go a little 'greener'. I just got some lovely napkin rings as a gift that these would look fantastic in! Beautiful napkins! We are about to move and these would help make meals in our new place special. Love the favorites and the napkins! I love those napkins. And I love the Kelly Wearstler quote. wow, I love seeing the inspiration behind an artist's work. love the list, love your textiles!!!!! Wolfum...amazing. Annabel's grandfather would surely say Belissimo! And frankly so do I. Ciao! How very nice of you!! Have a wonderful time on your vacation :). What a fantastic photo of your grandparents! Your grandmother was so beautiful. Can you tell us more about this photo/them? Love the napkins--but covet Annabel's grandmother's gams! And great style too. lovely print on those! the fabric she stretched is just amazing. Beautiful napkins... The print is just lovely. Amazing, just started reading your blog and I am totally addicted! Oh my, such a lovely prize! I adore that fabric. I could use it as napkins, but I may even think about sewing it into pillows. Terrific. Thanks to Annabel for the giveaway, and thanks to you, Joslyn, for hosting! Enjoy your vacation. These are great prints. And I love the Girard prints, too. Inspiring all around. love the Kelly Wearstler quote... so true! thanks for the giveaway... was just contemplating only using cloth napkins. Love the textiles.....great wonderful prints. what a beautiful list. Have I ever mentioned I have a soft spot for napkins especially ones as stunning as these! love the b/w image of Annabel's grandparents and how she describes them....a dynamic duo indeed. Beautiful list and amazing prints. Thank you for the giveaway. These are so lovely! And the inspirations get the wheels turning in my head about how to make a statement with color-- or its absence. Thank you for sharing other blogs you read with us! What great inspiration! I love old photos - her grandparents were quite a couple! These are beautiful! I'm going to study graphic design in college, and textiles also really interest and inspire me. i love her style & her blog !!! I can't wait for the Wolfum shop to open! Thanks for introducing me to their textiles. I'm now obsessing over new pillows and napkins! what inspiring inspirations. i want those napkins! What lovely napkins, I love all the designs. I also enjoyed looking at the pic of her grandparents. obsessed with all things wolfum!! So gorgeous!! Love hearing what inspires these artists. Thank you for the giveaways and for exposing us to these great artists! What a lovely way to elevate every-day dining!